Avalanche safety is paramount when heading out to ski tour or splitboard in the backcountry. Being prepared means having the right tools for self-rescue (transceiver, shovel and probe), as well having as the minimum amount of education necessary to know how to manage avalanche hazards so that you hopefully never have to self-rescue. The foundation of this avalanche education is based in snow science, described by Wikipedia as “how snow forms, its distribution, and processes affecting how snowpacks change over time.” These concepts are introduced in recreation courses such as Avalanche Canada’s Avalanche Skills Training (AST) Level 1 that you can do as part of our Intro to Alpine Touring program, but a greater understanding of the tiny, but potentially very dangerous, snow crystals takes much longer to learn. The opposite of accumulation. A combination of processes (such as melting or evaporation) which remove snow or ice from the surface of a glacier or from a snow-field. Commonly used in the context of “ablation zone,” in reference to an area of a glacier that is receding. The direction toward which a slope faces. For example, north aspect slopes face toward the north. Important when considering the effects of solar radiation or wind loading on the snowpack. South aspects typically get the most sun, meaning snow will often be of less quality than north aspects. The surface across which a slab avalanche releases. In early season snowpacks, the bed surface can be the ground but is usually a crust or a harder layer of snow. The bed surface should not to be confused with a weak layer. Used to define a slope when wind has blown across it, picking up snow from the windward side of ribs and outcrops and depositing the snow in lee pockets. (see below) These lee pockets are a hazard that can release as an avalanche when triggered by a skier, snowboarder or snowmobile. Large, hollow snow crystals with edges, rims and ripples on the surface, the result of faceting (see below). Depth hoar can form when there are high internal temperature disparities in the snowpack ie. the snow on the surface is much warmer than snow closer to the ground. Depth hoar accumulates as cup-shaped snow crystals, often generating weak layers in the snowpack. When snowflakes morph into more angular grains that bond relatively poor to one another, creating a weak layer. Faceting is often visible on the surface of the snow (surface hoar, see below) but can also form under the surface with a high temperature gradient in the snowpack (depth hoar). Areas on the downwind side of ridges and other terrain obstacles, where wind flow often deposits deep accumulations of snow. Usually refers to those slopes sheltered or protected from the wind. For example, an east-facing slope is in the lee of a west wind. Lee slopes are often susceptible to wind slabs, which can release as slab avalanches. Small, usually harmless avalanches. 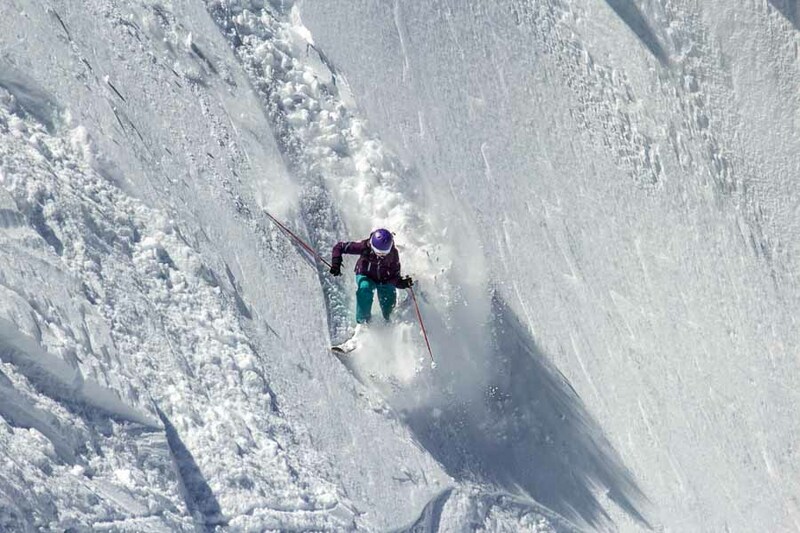 Sluff can actually help stabilize steep snow slopes over time. Technically, a sluff is any snow slide that moves less than 150 ft. (50 m) slope distance. While sluff usually won’t trigger a larger avalanche, it can knock skiers and snowboarders off their feet. Crystals, often shaped like feathers, spikes or wedges, that grow upward from the snow surface when air just above the snow surface is cooled to the dew point. Surface hoar is the winter equivalent of dew. Surface hoar grows most often when the wind is calm or light on cold, relatively clear nights. These crystals can also grow during the day on shady slopes. Once buried, layers of surface hoar are slow to gain strength, sometimes persisting for a month or more as potential failure planes for slab avalanches. A snow slab is placed in tension by the straining and stretching of the snowpack over terrain irregularities. The tension zone of a slab occurs at the top where the slab is trying to pull away from the stable snow. The tension zone will often be the same as the avalanche start zone on a slope. The language of avalanches can sometimes get a little technical, so it’s helpful to at the very least understand the terminology. The good news is that Avalanche Canada has made sweeping changes to its forecasts in recent years to simplify the language and break up paragraphs of texts with infographics and more digestible data. Don’t forget that these terms are only useful in the broader context. That means getting trained by a professional on an avalanche course, frequently observing avalanche bulletins and learning from a mentor.